Home Uncategories DIY – Design It Yourway! If you have a creative bent, you too can help us make your favourite media player, VuLiv even more Beautiful, even more Playful, even more Useful. 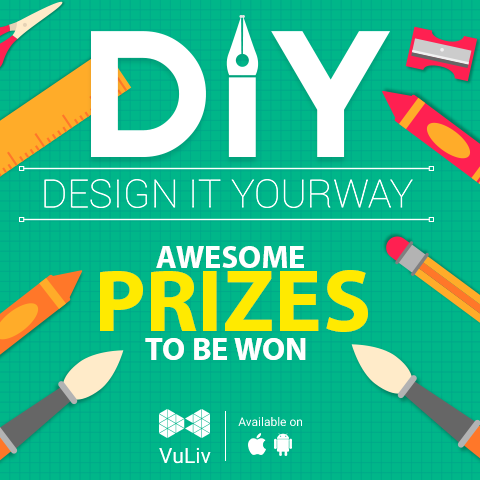 Yes, you read that right, we are giving you a chance to design VuLiv your way and you can even stand a chance to win awesome prizes! Just enroll, download your project, create an awesome design with in the given time and feel lucky! Yes, you will have to do it within the allocated time, but again you have the advantage to pick a project of your choice. If you think you can design VuLiv Media Player better than us, what are you waiting for? Just visit the below link, create your account, enroll yourself for the challenge and get started!